Unloading on offense, the Sun Valley Suns senior men’s hockey team posted the 600th victory in the 39-year history of the franchise with a 10-2 rout of Tri-Cities (Wash.) Hockey Source Saturday at Sun Valley Skating Center. Three-time Suns leading scorer Bryan O’Connell, Sun Valley Youth Hockey alumni Spencer Brendel, center Derek Grimes and newcomer Mike Curry each scored two goals for the Suns (3-5-0). 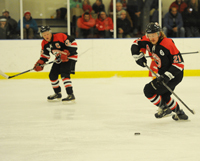 The home team jumped ahead 4-0 after one and bounced back from Fridays’ 5-3 loss to Tri-Cities. Alaska native Curry, 29, was the most pleasant surprise addition for Suns coach Steve Morcone. The 6-4, 215-pound wing who played four seasons for Univ. of Minnesota/Duluth amassed four goals and two assists in his first two Suns games to lead the home team, who out-shot Hockey Source 93-66 for the two-game series. “The win was a good momentum builder. We haven’t played well yet coming from behind, so we went out and got the lead and kept Hockey Source from getting quality chances,” said Morcone about Saturday’s dominating win. A flurry of Suns turnovers in the first period of Friday’s loss caused Tri-Cities to take leads of 3-1 and 4-1. Visiting goalie Josh Smith (47 saves) did the rest with a sparking effort between the pipes. There will be no Suns games on the Jan. 17-18 weekend. Next games are Jan. 24-25, when Bobby Farrelly’s Boston/East Coast Gutter Snipes are due to skate into the Sun Valley barn. FIRST PERIOD—(1) Tri-Cities HS, Ricky Doubrava (Beau Walker, Jake Kirkpatrick), 2:32. (2) Tri-Cities HS, Walker (Mikey Doubrava, Andrew Overman), 8:03. (3) SV, Mike Curry 1 (Justin Videen, Spencer Brendel), 12:21. (4) Tri-Cities HS, Hawkin Weinstein (Ricky Doubrava, A.J. Sanders), 13:09, power play goal. SECOND PERIOD—(5) Tri-Cities HS, Kirkpatrick (Walker, Sanders), 2:55, shorthanded goal. (6) SV, Doug Yeates 2 (Videen), 16:14. (7) SV, Curry 2 (Ryan Enrico, Videen), 18:55. THIRD PERIOD—(8) Tri-Cities HS, Walker (unassisted), 19:24, shorthanded and empty net goal. SHOTS ON GOAL—Tri-Cities 15-14-9 for 38; Sun Valley 20-16-14 for 50. GOALIES—Tri-Cities, Josh Smith (47 saves); Sun Valley, Ryan Thomson (33 saves, 4 goals, 2-5-0 record). HITS—Tri-Cities 12-12-7 for 31; Sun Valley 20-16-11 for 47. FACEOFFS WON—Tri-Cities 11-12-9 for 32; Sun Valley 10-9-10 for 29. TURNOVERS—Tri-Cities 11-7-9 for 27; Sun Valley 22-12-7 for 41 (Kurt Wenzell stats). CRASH BALLOU’S TOP STARS—No. 1—Beau Walker (Tri-Cities). No. 2—A.J. Sanders (Tri-Cities). No. 3—Goalie Josh Smith (Tri-Cities). OFFICIALS—Chris Benson (referee), Tyler Hanson and Pat Ballou (linesmen). NOTES—Coach Steve Morcone had good things to say about wing Mike Curry. “He has a lot of experience, is solid, young, quick, fast, big and strong. He’s not going to get knocked off his feet. He can carry the mail and get creative,” said Morcone……The 22 Suns turnovers in the first period put the home team in a hole. Morcone said, “We’ve been having problems with neutral zone turnovers and turnovers at the blue line, and the same thing happened tonight.”……Suns forward lines were Ryan Enrico-Derek Grimes-Bryan O’Connell, Taylor Rothgeb-Sinjin Thomas-Taylor Crawford, Spencer Brendel-Justin Videen-Mike Curry, with Max Kwok filling in. Defensemen were Ivars Muzis, Zak Trevor Thomas, Doug Yeates and Drew Barsch. Back-up goalie was Bobby Farrelly…..Wing Taylor Crawford, like fellow Suns rookies Justin Videen and Greg Chapman, is a member of head coach Cal Ingraham’s Boise State University 2013-14 men’s club hockey team. The BSU Broncos had a busy schedule in October and November with a combined 8-3-3 record including an unbeaten 6-0-1 mark in November. Videen leads the BSU squad in scoring with 14 goals and 13 assists for 27 points in 13 games including a team-best 3 shorthanded goals. Crawford is ranked second with 12 goals and 14 assists for 26 points with a team-high 5 power play goals. Chapman, who sat out tonight’s game with his fighting ejection from the Jan. 4 game against Jackson Hole Moose, is ranked fourth with 4 goals and 11 assists for 15 points in 10 games…..Tri-Cities goalie Josh Smith stopped all 14 Suns shots in the decisive third period and absolutely robbed Ryan Enrico with his pad, as Enrico was looking at an open net and the equalizer on a Suns power play with 6:25 left in the game…..The Suns were 0-for-7 on the power play and Tri-Cities 1-for-4……Suns goalie Ryan Thomson kept his team in the 4-3 game with two sparking saves on Tri-Cities center Beau Walker in the third period. The first came three minutes into the final period when Walker skated in alone on a power play. The second came when Walker broke in on a delayed penalty and Thomson was equal to the shot…..Walker hit the post with 1:13 left in the game just as Thomson left the ice in favor of a sixth attacker. Then, with the Suns in a 6-on-4 advantage and the goal empty, Walker had another chance and clanked a clearing attempt off the side boards that somehow dribbled into the goal for the final tally……Hockey Source brought only a handful of players and a different goalie from the team that came to Sun Valley last Feb. 22-23 and dropped a 5-2 and 3-1 series to the Suns. FIRST PERIOD—(1) SV, Bryan O’Connell 4 (Ivars Muzis, Max Kwok), 10:17. (2) SV, Ryan Enrico 5 (Mike Curry), 13:07, shorthanded goal. (3) SV, Derek Grimes 3 (O’Connell), 13:55. (4) SV, Spencer Brendel 2 (unassisted), 14:42. SECOND PERIOD—(5) SV, Curry 3 (Enrico, Muzis), 5:40. (6) Tri-Cities A.J. Sanders (Beau Walker, goalie Josh Smith), 8:01, power play goal. (7) SV, Grimes 4 (Liam Jablonski), 10:02. (8) SV, Sinjin Thomas 1 (Jablonski, Drew Barsch), 10:40. (9) Tri-Cities, Ricky Doubrava (unassisted), 15:30. THIRD PERIOD—(10) SV, Curry 4 (Sinjin Thomas), 8:04, power play goal. (11) SV, O’Connell 5 (Doug Yeates, Kwok), 10:06, power play goal. (12) SV, Brendel 3 (Curry, Enrico), 18:11. SHOTS ON GOAL—Tri-Cities 6-15-7 for 28; Sun Valley 21-11-11 for 43. GOALIES—Tri-Cities, Josh Smith (33 saves); Sun Valley, Ryan Thomson (26 saves, 3-5-0 record). CRASH BALLOU’S TOP STARS—No. 1—Bryan O’Connell (SV). No. 2—Derek Grimes (SV). No. 3—Spencer Brendel (SV). OFFICIALS—Tyler Hanson (referee), Bobby Noyes and Eric Wingard (linesmen). NOTES—Two penalty shots were called on separate plays in the first period. A delay of game penalty whistled against Hockey Source resulted in Bryan O’Connell taking and missing his penalty shot attempt. Hockey Source’s Beau Walker was stopped point blank by Suns goalie Ryan Thomson on his penalty shot attempt, caused by a tripping penalty called against Suns defenseman Doug Yeates.……Suns head coach Steve Morcone praised Thomson for his 26-save effort. “Ryan was back on his game, not giving up rebounds,” the coach said…..Morcone also praised defenseman Drew Barsch, the Wood River High School graduate and former top tackler for the Wolverine football team who played two solid games on defense for the Suns against Hockey Source. Morcone said, “We only had four defensemen all weekend, so having Drew play like he did was very important to us. Every shift, he got a little better and better. He did not make mistakes and showed incredible composure with the puck. He didn’t flinch. He was just a rock back there.”….Morcone added that Liam Jablonski, another WRHS graduate and Sun Valley Youth Hockey product, filled in as a wing tonight and played really well, contributing 2 assists….Barsch is a freshman defenseman for the Boise State University club hockey team. He had played 13 games for Cal Ingraham’s Broncos, who have competed in the American Collegiate Hockey Association and are moving into the Mountain West Collegiate Hockey League…..Morcone said that Suns co-coach John Burke has been actively recruiting players this season to bulk up the Sun Valley roster, and coach Ingraham has been helpful in sending some of his BSU players up to Sun Valley…….Suns forward lines were Max Kwok-Derek Grimes-Bryan O’Connell, Spencer Brendel-Ryan Enrico-Mike Curry, Liam Jablonski-Sinjin Thomas-Derek Grimes/Taylor Rothgeb. Defensemen were Ivars Muzis, Doug Yeates, Trevor Thomas and Drew Barsch….Suns back-up goalie was Pat Ballou…..Rothgeb, who separated both shoulders skating for the Suns last season, aggravated a shoulder injury when he went hard into the net tonight early in the second period. His absence caused coach Morcone to juggle his forward lines, having only eight forwards…….Former Idaho Steelheads star Marty Flichel didn’t play this weekend. He was nursing a broken hand, Morcone said, but the coach expects Flichel back soon…..Playing his first series for the Suns, former University of Minnesota-Duluth wing Mike Curry was the weekend-high scorer with 4 goals and 2 assists…..The two Suns power play goals in the third period equaled the total power play goals for the home team in its first seven games…..Both Suns power play goals, by Mike Curry and Bryan O’Connell, came on beautiful lead passes, from Sinjin Thomas on Curry’s goal, and from Doug Yeates on the O’Connell thousand-fakes-across-the-crease magic…….Tri-Cities left wing A.J. Sanders received a 5-minute unsportsmanlike conduct major and was ejected after deliberately aiming a shot at the Suns bench five minutes into the third period. Sanders was standing at the left point with the puck in his offensive zone when he fired the puck at the Suns bench, rattling if off the side boards, instead of aiming the shot at goalie Ryan Thomson. Players on the Suns bench took exception to the direction of the shot and its intent. Nobody was hit by the puck…..The scheduled Suns weekend series with New York Beaver Dam Jan. 17-18 has been canceled.